Includes fuel cap, gauge and shut off valve. Keeping your EU3000is Honda covered while in storage or traveling is essential to having your generator clean and ready to go when you need it the most. This cover accessory is custom fitted for the EU3000is, waterproof and is breathable polyester fabric that holds up well to the sun also. Has a strong, snug elastic band to hold it tight around the bottom . Silver with Honda Name on both sides. Customers report that they have used it on Norther Tool and Harbor Freight 3000w generators as well. Cover is easy to put on and take off. Fits fine also when using Honda EU3000is wheel kit. This EU3000is cover is meant to use on generator while in storage or during transport; not while running. Remote Start from up to 100' away. If you have been using your portable generator then be sure to let it cool down for at least 15 minutes before loading it onto a transport vehicle. A hot engine can not only burn you but it can ignite some materials that you may have loaded the generator close too. You also want to keep the generator sitting level in order to prevent fuel leakage. It is also good to cover your generator to prevent dust and debris from getting into the engine parts while driving. Before storing your portable generator follow the directions for storing your unit found in your Owner's Manual. Make sure the area where you want to store your generator is free of excessive humidity and dust. Keeping a good heavy duty generator cover that is made to fit your brand and model will also help keep dust, etc. out of your unit while in storage. 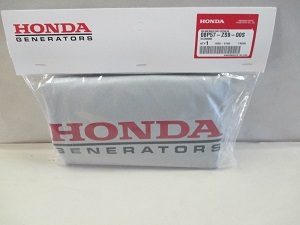 In addition to a generator cover here are some other Honda EU3000is accessories you might need:. Honda Silver Custom Fitted Generator Cover for EU3000is generator. Camouflage cover for Honda EU3000i Handi. Wheel Kit for Honda EU3000is mobility. Wireless Remote Start System for Honda EU3000is generator. It's a Honda! But even so it needs to be covered while in storage and kept clean and dry. This EU3000is model generator is super quiet and fuel efficient. It provides inverter stable power for your computers and other electronic devices. So, be sure and keep yours dry and dust free while in storage or carrying it in the back of your open pickup truck. This cover was made to fit the Honda Eu3000is Portable Power inverter generator.